After the stop in Frankfurt (DE) with IEMA-Ensemble, in Bobbio and Milan (IT) with IDEA/Divertimento Ensemble, in IRCAM’s festival ManiFeste 2018 (FR), the ULYSSES Ensemble gathered from 15 to 20 July 2018 in Royaumont (FR). 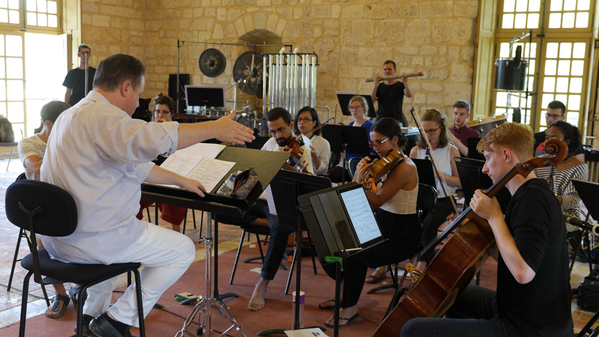 During these intense five days, the young musicians rehearsed in Royaumont under the direction Gregory Vajda – in the frame of the Programme Voix Nouvelles - 2 pieces already performed in Milan by Mauro Lanza et Marco Momi (#9 and Almost Nowhen), one piece by Philippe Leroux (d)TOURNER and a new piece by the Annie Hui-Hsien Hsie, composer laureate of the Académie Voix Nouvelles 2017, Elastic Chirping commissioned for the occasion. Directed by Gregory Vajda, the rehearsals mainly focussed on the specific work on the pieces by Philippe Leroux and Annie Hui-Hsien Hsie. In (d)TOURNER, the point was to understand the circular motion studied by Philippe Leroux in terms of the movement of the instrumental sounds in the stage space (the instruments are arranged in a particular way), the rotation of melodic movements or timbre transformations in the bow rotation phenomena, for string instruments, for example. In Elastic Chirping, the composer wanted to study the information communication phenomenon questioning the possibilities in the expansion and compression of materials, and the context within which meanings can arise or be erased. Following this experience in Royaumont, the young musicians will continue the tour in September in Utrecht (NL) at Gaudeamus Muziekweek, in cooperation with the IEMA – Ensemble. Stay tuned!